Frequently referred to as “standing hay” or “autumn-accumulated forage,” stockpiling is a forage management practice to accumulate late summer and fall growth of tall fescue (from August to November) as stockpiled feed for winter grazing (November through February). What Is the Purpose of Stockpiling Tall Fescue? Stockpiling provides in situ (in the field) forage for grazing livestock during periods of limited forage growth (that is, the winter months). Therefore, stockpiling allows managers to extend the grazing season (Figure 1) well beyond the regular grazing period and consequently can reduce and replace the amount of conserved forage (such as hay, haylage, or silage) needed for winter feeding of livestock. Figure 1. Forage systems of tall fescue and tall fescue plus stockpiling. The red rectangles with question marks show periods of forage shortage for each system. What Grasses Can Be Stockpiled? The best grasses to stockpile are those that will retain their green color and forage nutritive value (energy and protein) later into the winter. In addition, the grass should be somewhat resistant to low temperatures and able to form good sod (ground cover). Tall fescue is such a forage that is adapted to the transition region in the United States. How to Use Stockpiled Fescue? To use stockpiled forage efficiently, you must manage grazing by using an electric fence and rotational stocking. Uncontrolled grazing may waste about 50 to 60 percent of the forage because of trampling and manure droppings on unused forage. First, install a temporary electric fence across the field, dividing it so the area to be initially grazed has a source of water and minerals. Once the animals have grazed off this first area, move the fence back, opening up a new forage strip. Repeat this system until the entire field has been grazed. The greater the stocking density (that is, the number of animals per unit of land area at a given point in time), the more frequent the movements, and consequently the greater the utilization of available forage by the livestock (Figure 2). A group of 10 lactating beef cows, each with an average weight of 1,000 pounds, has a daily group intake requirement of 250 pounds of dry matter (rule of thumb for intake is 2.5 percent of body weight). The total dry forage present has been estimated at 3,100 pounds per acre. Rotational stocking will be used for moving animals every three days (75 percent utilization efficiency). First, let us determine the amount of forage that will be consumed at 75 percent utilization: 3,100 pounds x 0.75 = 2,325 pounds. This calculation means that although each acre has 3,100 pounds present, only about 2,325 pounds (75 percent) will be consumed. The amount of forage available per acre divided by the daily intake requirement of the group gives us the number of grazing days that the 1-acre paddock will be able to supply forage to the group of animals: 2,325 lb / 250 lb = 9.3 days. Because we will be moving animals every three days, then the 1-acre paddock can be divided into thirds, or into nine sections if the animals are moved every day (which provides the most efficient utilization with minimal wasted herbage). 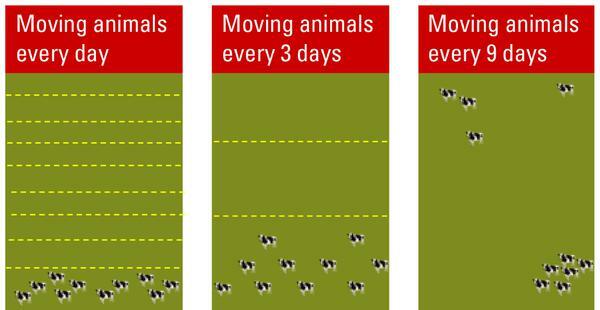 Starting on day 10, the animals need to be moved to a new paddock (Figure 2). Figure 2. Greater utilization efficiency (less forage wasted due to trampling or manure droppings) and greater manure distribution is achieved with more frequent livestock movement, such as daily or every 3 days, compared to longer grazing periods. What Is the Nutritive Value of Stockpiled Fescue? Stockpiled tall fescue has excellent nutrient content. One reason for this high quality is that tall fescue remains vegetative in the fall months and contains no stems or seed heads of low nutritive value. Another reason for the high quality of stockpiled tall fescue is that the sugar content and digestibility of tall fescue in autumn months are elevated (Burns and Chamblee, 2000a; Figure 3) and exceed the nutrient requirements of beef cattle. 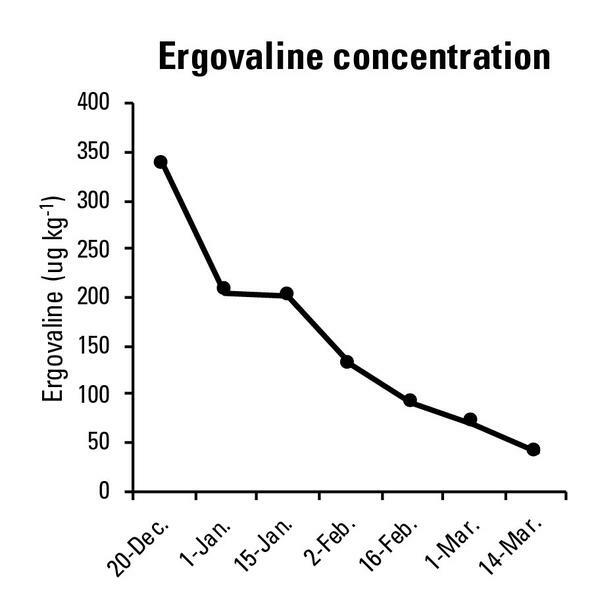 In addition, ergovaline concentrations, if present, decline in stockpiled fescue as the winter progresses (Figure 4). Figure 3. Nutritive value estimates and proportion of green tissue of stockpiled fescue. Accumulation period for stockpiling started Aug. 1. TNC=total nonstructural carbohydrates, NDF=neutral detergent fiber. Plots were fertilized in Aug. at 80 lb N/ac. Adapted from Burns and Chamblee (2000a). Figure 4. Ergovaline concentration in stockpiled fescue Kentucky 31 averaged across two years. Adapted from Kallenbach et al. (2003). Select the area to be used for stockpiling well before the beginning of the accumulation period. Stage-back the pastures in mid-August to early September by removing (by clipping or grazing) any excess growth above 3 inches that accumulated over the summer. After stage-back, fertilize the pasture with 50 to 80 pounds N per acre and close it to grazing. Pastures will accumulate growth at the rate of about 15 to 35 pounds of dry matter per acre per day during the accumulation period (August to November). Graze all other pasture on the farm (especially warm-season grasses) before beginning to graze the stockpiled growth. About a half-acre of stockpiled grass per animal unit will provide about 60 to 90 days of winter-grazing. Use electric fences and rotational stocking to strictly allocate the stockpiled forage to increase its efficiency of utilization. Apply fertilizer or lime (or both) as needed (based on a soil test) to tall fescue pastures that are to be stockpiled. Well-maintained fescue pastures are responsive to N fertilization if rainfall is adequate. Several trials in the transition region have reported positive responses of tall fescue (such as greater dry matter yield and greater proportion of green tissue) as a function of N fertilization rate (Figure 5 and Figure 6). In addition, the source of N fertilizer plays a critical role in the realization of this response. Some sources of N, such us urea and urea-based fertilizers, are volatile, and N mineralization and decomposition from organic sources, such as animal wastes, can be slower during the winter months (Castillo et al., 2010; Teutsch et al., 2014; Figure 6). In North Carolina, Burns and Chamblee (2000b) reported a three-year average dry matter yield of about 3,200 pounds per acre by mid-November for stockpiled Kentucky 31 tall fescue fertilized in late August with 80 pounds per acre of ammonium nitrate fertilizer. Figure 5. 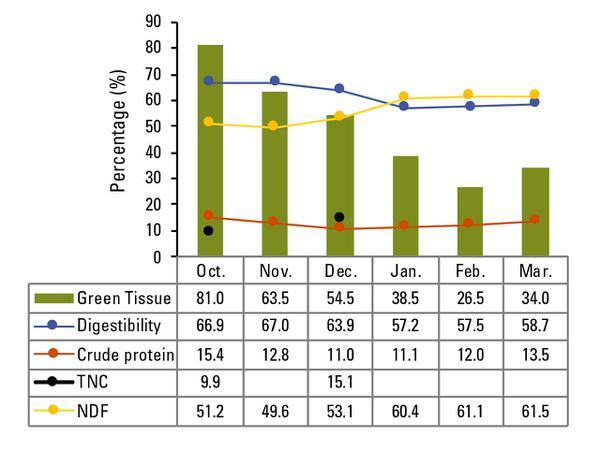 Changes in dry matter accumulation and in the proportion of green tissue due to N fertilization rates. Nitrogen rates were 0, 45, and 90 lb/ac. Data are averages of three years. Adapted from Taylor and Templeton (1976). Figure 6. 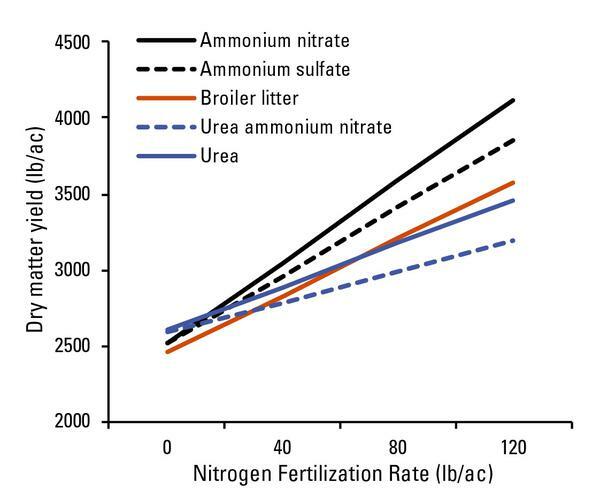 Stockpiled fescue responses to greater N fertilization rates and the extent of the response from differing fertilizer sources. Adapted from Teutsch et al. (2014). Burns, J. C., and D. S. Chamblee. 2000a. Summer accumulation of tall fescue at low elevations in the humid Piedmont: II. Fall and winter changes in nutritive value. Agron. J. 92:217-224. Burns, J. C., and D. S. Chamblee. 2000b. Summer accumulation of tall fescue at low elevations in the humid Piedmont: I. Fall yield and nutritive value. Agron. J. 92:211-216. Castillo, M. S., L. E. Sollenberger, J. M. Vendramini, K. R. Woodard, J. T. Gilmour, G. A. O’Connor, Y. C. Newman, M. L. Silveira, and J. B. Sartain. 2010. Municipal biosolids as an alternative nutrient source for bioenergy crops: II. Decomposition and organic nitrogen mineralization. Agron. J. 102:1314-1320. Kallenbach, R. L., G. J. Bishop-Hurley, M. D. Massie, G. E. Rottinghaus, and C. P. West. 2003. Herbage mass, nutritive value, and ergovaline concentration of stockpiled fescue. Crop. Sci. 43:1001-1005. Taylor, T. H., and W. C. Templeton Jr. 1976. Stockpiling Kentucky bluegrass and tall fescue forage for winter pasturage. Agron. J. 68:235-239. Teutsch, C. D., J. H. Fike, G. E. Groover, and S. Aref. 2014. Nitrogen rate and source effects on the yield and nutritive value of tall fescue stockpiled for winter grazing. Online: Forage & Grazinglands doi:10.1094/FG-2005-1220-01-RS.